in their education, despite the odds of the ghetto. The East St. Louis High School Flyers hit the field for an early game in the season. Their coach (in the background) is Bob Shannon, who tries to change their expectations from being Friday night heroes to getting an education and building success through athletics. He admits he doesn't get through to everyone, but 11 of 16 seniors on last year's team went to college. It's a drizzly afternoon in East St. Louis, the day the oppressive August heat finally broke and jackets become a welcomed option. On the well-worn field behind East St. Louis Senior High, members of the school's championship-winning football team are suiting up and stretching out, getting ready for their first game of the season just four days away. Supervising the practice is head coach Bob Shannon, with the aid of several assistant coaches. His eyes seem to take in everything — and not just what's happening on the practice field. He approaches every spectator, finds out who they are and what they're doing there. An hour into practice, a suited-up player jogs from the locker room onto the field. "Where you been?" Shannon yells at him, as the other players and the assistant coaches fall quiet. "Where you been? Where you been?" he repeats. "I see what your problem is. I see exactly what's your problem. You're a follower. You're not a leader. You'd follow those guys to the end of the earth." makes it difficult to cultivate a leadership-oriented mindset. "A lot of these kids are just looking for attention, and they wind up doing things for negative attention," he says. "I'm trying to focus their energy and get them attention through football. From there, it can be a ticket to other positive things." A prominent sign at the main entrance to the football stadium behind East St. Louis High reads: "No Drugs, Alcohol or Guns allowed." It's a simple message, but one that speaks volumes about the school it borders, the students who attend games there, and the neighborhood in which it sits. "Around here, that's not an exaggeration," says Dr. Art May, the high school's athletic director. "There's a lot of all of that here, a lot of dangerous elements pulling at the kids, trying to get their attention." To many people, the sign is just another illustration of the city's ongoing deterioration. With its high crime rate, high unemployment rate and per capita income of just $6,421 according to the 1990 census, East St. Louis has been singled out as an example of urban decay by such national media outlets as the Wall Street Journal and 60 Minutes. It has become famous for its stranger-than-fiction tales of corruption and poverty, from the court order that once awarded City Hall and a city dump to a prisoner badly beaten in jail to the longtime lack of any city garbage pickup service. But in Shannon and the teams that he's coached to hundreds of victories, the city also has achieved some degree of fame in a decidedly more positive light. He has been lauded as a proverbial flower in a field full of weeds by fans ranging from his former players to journalists to the president of the United States. 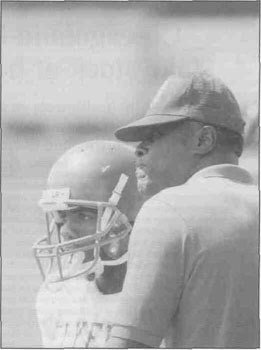 It's not his coaching skills alone that have earned Shannon such widespread praise, though they are considerable: He lead the East St. Louis High football team, the Flyers, to national championships in 1985 and 1989, as well as six state championships. Rather, it's the discipline and hard work he demands from his players off the field as well as on. "He's a good motivator for the simple reason that he works hard," says May, who has known Shannon since their days together at Tennessee State University in the mid-1960s. "Out of all the coaches on my staff he's the hardest worker. He stresses not only football, but checks with teachers to make sure his players are attending class and doing well in those teachers' subject areas, and that winds up helping a lot of them get into college and do well there. Some of our star athletes — he'll hold them out of games if they're not doing well in a certain week. "With most high school coaches, all they believe in is winning at all costs, not stressing academics or fun," May says. "To them, winning is everything. Not Bob — he believes learning should be stressed." And while Shannon might not be unique as a football coach who recognizes the importance of good grades, the setting in which he tries to implement this philosophy sets him apart. "The things he's doing you might find in coaches all over the country," May says. "But East St. Louis is a ghetto. It's a poverty area." Indeed, according to the Illinois State Board of Education, 76.6 percent of the district's students are categorized as low-income, making it the fifth-poorest of the state's 942 districts. "There are lots of drugs, lots of gangs. If you can motivate kids to do well under these conditions, you know you're doing a good job," says May. "That's why Bob sticks out so much." While Shannon's players practice defense formations, a group of giggling girls stands nearby, watching and hooting at the boys. Nothing out of the ordinary, it seems, from the usual flirtations and teasing that go along with high school athletics. But as the girls lose interest in watching safety and cornerback blitzes, their talk turns to the woes of babysitting. Not the problems they've encountered while watching others' children, but the trouble they've had finding reliable people to care for their own kids. From there, the conversation moves on to the challenge of stretching their Aid to Families with Dependent Children checks so they last an entire month. "Yeah, I'd say there's more here than the normal adolescent distractions," Shannon says. He's taking a short break from heading the team's five-and-a-half hour afternoon practice, but his eyes rarely leave the field. "You see a lot of teen pregnancy, fatherhood. And the gangs are always trying to be a lure. It's gotten to a point that a lot of guys won't come out for football because it's a sign of weakness to follow instructions and listen to authority. It takes a strong guy to be different, a lot of courage in this community to be different." And when it comes to his team members, Shannon won't stand for anything less. "If they're getting involved in drug or gang activity and they're caught, they're off the team. Plain and simple. I will not stand for that, and the kids know it. We've built the kind of relationships where the team members will come and tell me, 'Coach, I think so-and-so's been doing drugs.' Or 'Coach, so-and-so's been hanging around with gang members.' They're looking out for each other." Besides the obvious reasons that Shannon would shun drugs and gangs — such as the danger they pose to his players' health and safety — he says they also reveal that character flaw he so detests: a lack of leadership. "I tell the players all the time, especially the seniors, that I'm looking for leaders," Shannon says. "Ones to keep the bickering down after practice. Ones to recognize divisive language. We're looking for people with pride who will do the right thing. The right thing may be getting yourself a college football scholarship, and the right thing may be to tell us, 'Coach, so-and-so's in a gang.' "
So Shannon always is watching, searching, for even small signs of weakness. For example, he says, "My quarterbacks don't wear earrings. A quarterback must be a leader, must be held to a little higher standard. An earring shows that he is a follower." few years to make allowances when a player has a legitimate excuse, such as a summer job. "I used to be a Marine drill sergeant about punctuality and always being at practice," he says. "But a lot of these kids have serious demands on them. Some have to work or help out at home. I've had to change over the years and look at them a little differently. You have to change because they've changed. This community has changed. The value structure is constantly changing." Considering the Flyers' success during the 18 years Shannon has been their head coach, it's no surprise that offers for other coaching jobs have come his way. "I know he's had offers to go to colleges as an assistant coach," May says. "But this is what he likes — molding high school guys." And it's East St. Louis' environment, the ghetto environment, that appeals to him ... in part because it reminds him in some ways of his own roots. "I never had enough of anything — not enough food, clothes," Shannon says of his childhood years in Natchez, Miss. "But I always had hopes and dreams that I'd be able to take care of myself, be independent, accomplish something." He smiles broadly, revealing a space between his even white teeth, as he remembers an inspiring force in his life. "My fifth-grade teacher, Rebecca Miles, was one of the people who saw something in me," he says. "She convinced me, in short, that I could make something out of myself if I was willing to pay the price of hard work and willing to dream a dream no one in my family had done. She planted that seed." As a teen. Shannon got a job delivering furniture to some of the upscale homes in Natchez. "I got to see how those people lived, and that motivated me early, too," he says. "I wanted some of that nice stuff." Although athletics played an important role in his life, academics were ingrained in him as the key to success. "The Pittsburgh Pirates offered me $8,000 to play for them after high school, but I didn't think I could make it," he says. "In my heart I knew I wasn't good enough to make it. Your skills deteriorate as you get older. I wanted more stability, wanted opportunity that education could bring. Wanted security that in my middle life I could do something. I was always taught that what you learn, people can't take away from you." So instead of playing baseball for the Pirates, Shannon went to Tennessee State in Nashville on a football scholarship, where he was the starting quarterback his senior year. After college, he was drafted in the twelfth round by the Washington Redskins but cut eight weeks later. His instincts seemed to prove him right: It was his education that would propel him forward. "Sometimes, high school is too late to get to these kids," he says. "But some of them are just looking for a way to be successful. I want to teach discipline, sacrifice, the value of education and also build self-esteem by allowing success in athletics. Sometimes they are too far gone to get the whole message. Still, you do what you can. Hey — last year we had 16 seniors on the team and 11 went to college." Not all of Shannon's players who go on to college succeed, but Bryan Cox is a shining example of one who did. 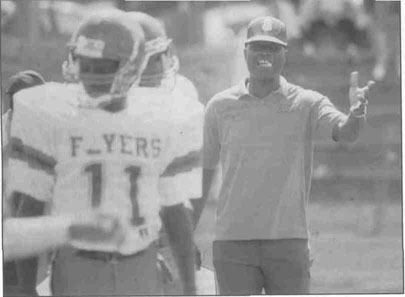 Cox played on the Flyers' national championship team in 1985, then went on to Western Illinois University. In 1991, he was a fifth-round draft pick of the Miami Dolphins, where he plays outside linebacker. Last summer, Cox returned to East St. Louis, where his family lives, and put on a football camp for the area youth — an event he says he'd like to schedule on an annual basis. "I felt like I could give some hope to kids in the area," Cox said in a phone interview from Miami. "When I was in junior high and high school, there were several NFL players from East St. Louis: Kellen Winslow, Kerry Glenn, Eric Wright. But none of them ever went back there — it was like they weren't from there. I want to show those kids there's nothing wrong with being from a ghetto environment. It won't keep you from being successful. I thought of it as sort of my duty, a way of giving back some things to football and to Coach Shannon. "What I remember most about Shannon is he was really strict, and a really straight guy," Cox says. "He never did anything that was illegal. He would never lie to a college recruiter or anyone else for you. He was a man of great character, and in my hometown it was very unusual for anyone to be that honest. He was a role model, second only to my parents. He checked your grades weekly and would chat with the teachers to make sure you weren't goofing around. Nobody on our team was allowed to get away with anything." Sam Morgan, the high school's principal since 1975, agrees. "All our coaches try to stay in tune with grades because a kid can not be on the field if he's not passing," Morgan says. "So there's something in it for Shannon also, because it keeps his players eligible so they can participate on the team. But he does it for more than winning. I've seen him jeopardize winning if it means showing a kid he's got to do better, or if he's been goofing off." Photo by Russ Smith boyhood to the Flyers' 1991 state championship-winning season, and details the discipline and attention to school he demands from his team. Since the book came out, Shannon says, speaking engagements have poured in from all over the country — so many that he has had to hire an agent to schedule them and weed some out. "I have a hard problem telling people 'no' because I've been blessed in life," he says. "I need somebody to insulate me." He will speak for free at children-related events because "I'm in the kids business," he says. "Last year I traveled to Boys Town [in Omaha] at my own expense to address a graduation ceremony. That's a once-in-a-lifetime opportunity." Otherwise, his going rate is $1,500 per speech, though he often receives several times that rate from groups he addresses. "This is something I really enjoy doing," Shannon says. "It's something I could see myself doing if I ever decide I'm finished with coaching. I'm going to be 50 next year, and I have begun thinking motivational speaking could be something I'd like to try as a second career. I've gotten to meet a lot of people through it and go a lot of places. And I try to tell my team this kind of thing is possible if you just work hard, push yourself hard, and keep working even when it's not easy going." As much success as Shannon has had in coaching high school football and reflecting well upon East St. Louis, he is far from universally loved. "The majority of the school board hates Bob Shannon with a passion," May says bluntly. "That's because he calls a spade a spade, and by that I mean he'll speak out about things that are important to him whether others agree with him or not. Like the stadium for example." To Shannon, the stadium — where the "No Alcohol, Drugs or Guns Allowed" sign hangs — is a metaphor for what he sees as the corrupt politics that have ruled the city for decades. Of a $12 million bond issue approved by voters in 1986 for various recreational projects, $5 million was supposed to go toward the stadium. Now that it's completed, though, May and Shannon say they see about $2 million worth of work in the project. There are no restrooms on the visiting side, and not enough water fountains. "Bob sung out about that, and that's one reason the school board doesn't like him," May says. "I don't get involved with the politics of it," Shannon says. "But I'll tell you something: My father grew up as a black man in Mississippi, and he couldn't say what he wanted. I feel I can say whatever I want. For $5 million they could have built an entire recreational complex for the youth of this city — something with an indoor track, basketball courts, everything. I want to go on the record saying I'm not happy with the way it was done. It's a waste of money in these economic times." Even with his outspoken nature, the school board wouldn't touch him with a 10-foot pole, May says. "They know the national media will descend on them if they ever tried to fire him. If he were anyone else, anyone with less notoriety, they would've found a way to fire him long ago. But he's got too much of a reputation, too many admirers." One of them is Bill Clinton, who spoke in the gymnasium of East St. Louis High School while campaigning for the presidency. Shannon says Secret Service agents used his office as a holding room for equipment, so he got to meet Clinton and now-Vice President Al Gore after the speech. Soon after, Shannon was named one of Clinton's "53 Faces of Hope" for inspiring success in his team under difficult circumstances, and he was invited to the Inauguration, where "I had a better seat than Nelson Mandela!" Shannon says proudly. "It's very difficult for me to explain how I felt at that moment. I'd come all the way from Natchez to where I am now just because I'd done what I'd wanted to do and I'd worked hard at it.